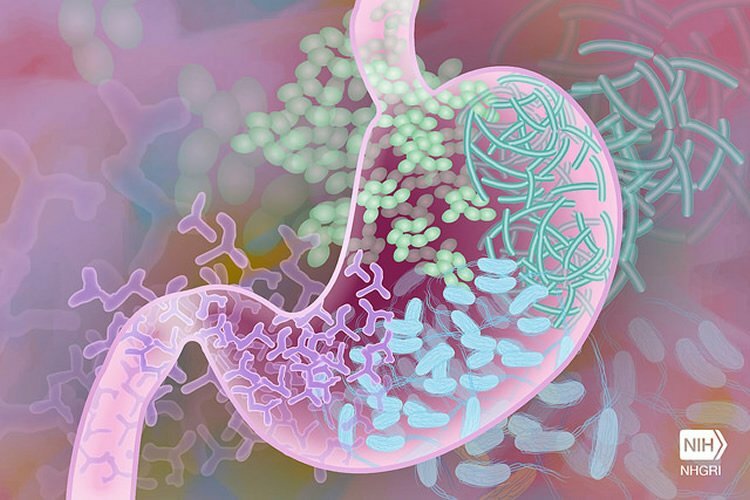 Researchers examine the role gut bacteria plays in the development of neurological disorders. Using mouse models of multiple sclerosis, researchers found compounds generated from the breakdown of tryptophan can cross the blood-brain barrier and activate anti-inflammatory pathways that limit neurodegeneration. Activation of these pathways have also been linked to Alzheimer’s and brain cancers. A study published this week in Nature sheds new light on the connection between the gut and the brain, untangling the complex interplay that allows the byproducts of microorganisms living in the gut to influence the progression of neurodegenerative diseases. Investigators from Brigham and Women’s Hospital (BWH) have been using both animal models and human cells from patients to tease out the key players involved in the gut-brain connection as well as in the crosstalk between immune cells and brain cells. Their new publication defines a pathway that may help guide therapies for multiple sclerosis and other neurologic diseases. The new research focuses on the influence of gut microbes on two types of cells that play a major role in the central nervous system: microglia and astrocytes. NeuroscienceNews.com image is in the public domain. Quintana and his colleagues plan to further study the connections to neurologic diseases and are also optimizing small molecules as well as probiotics to identify additional elements that participate in the pathway and new therapies.